A year loaded the stuff in the FJ we headed to the port of Marseille to take the ferry to Tunisia. There we expect one of the most charismatic 4x4 dispute evidence today. After a fantastic journey and saluted the majority of participants and members of the organization, we came to Tunisia and disembark. The moment they stepped ashore on the African continent is indescribable: feeling is a mixture of happiness and peace. Here begins the total disconnection of everyday life in the West: as we mounted antennas, and GPS stations' Let us forget about everyday problems. A quick call to the family to say that we have reached and the attack!. We descended quietly towards Gafsa, where we spend the first night, and we are already thinking about dinner awaits us! After passing the checks, we went to the briefing of the Organization: where we explain the details of the stage 1 starting tomorrow. We give and waypoints, without wasting a minute, we go to the room to turn on the computer and began to prepare the route. Start the first stage, and we have to draw it out first (we believe it bodes well that will bring us luck). The other teams are leaving in intervals 5 minutes. We take the first dunes without problems and with great agility, but gradually things get complicated and sand just to the ears! But that it is, no?... sand and more sand, with temperatures hovering around 20 ° C in October. What a delight to be here surfing between dunes! Within two hours of starting the stage I'm enjoying it while I tell him my copilot that if every day is so, I will not participate in any other race than this or have this format 100% sand. I'm having great riding my FJ, gently across the ridges, without a break even a morrada, all soft, rhythmic, without stopping ... except the hooked, which by the way they are a few. I decide it's over typical full part in tests stony Moroccan tracks that punish the suspensions and tires and the format forces you to follow a straight course as it reaches bore. At the end of the day my copilot and I are excited about what we have enjoyed. I can not believe it, after 20 years competing at the professional level, I just discovered a way of totally amateur competition that gives me the same feeling that the professional competition, but without the stress that goes with it. If we add a perfect trip, with some waypoints more than studied and well placed, a successful system just score and regulations, the test result is really interesting. The following days are still a joy and classification remains tight, which forces us to surpass ourselves, marking the 100% waypoints in the last three stages, thing that our opponents also make! Al final, differences in the final classification will be given by the scores of the first two days. But the best was the last day: after 23 driving hours (Yes, Yes… 23 hours! ), I explain: after finishing the stage and declare winners of this edition, and while we were doing an interview for the press, We heard by the issuing vehicle someone asking the organization to move to a point about 5 km from where we were, because there were three vehicles with problems. We offer to help out and answer that better than us, surely by the time it is, will have to spend the night in the desert ... they hear my ears! ¿Night in the desert? not that I can not miss! This is the icing on the cake for this great adventure. As great night it then be solved once all mechanical problems. Blessed organization! After mounting the tent and light a great bonfire, propose a referendum to decide whether to sleep in the desert or try to reach the hotel. The result, as: more Dunes! Night decided to drive to the hotel but for this we have to go back 10 km, because although the hotel is 5 km forward, these are very technical and make the dark is not very advisable. Go ahead!, We assemble a convoy of three cars of organization, the five participants who have recovered and we opened nine cars caravan. I must say that is the nicest thing I've done with my FJ in recent years, took 8 hours to leave this beautiful maze of dunes, constantly looking for low passes, since one of the rescued car carries a small transmission problem that makes it hard crestear. With freezing cold breeze and a side constantly clears the ruts, the progress of the caravan is eternal but exciting. Although exhausted, the certainty of living a real adventure that can hardly be repeated, It makes all of us show a big smile from ear to ear!”. 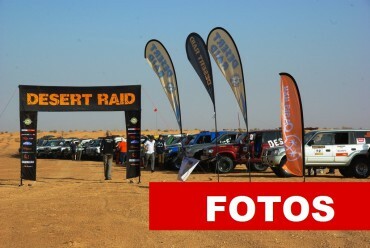 Undoubtedly, Desert Raid format is a race of reference for any fan 4x4, regardless of whether their experience level. Both navigation and driving us we had to put all the batteries for the end of each stage, and also for us to get this new victory. I take this opportunity to thank the organization for a job well done, the sponsors for their support to this race possible and, as, all participants / rivals, without them, I would not have felt anything of what I have written, nor would it have been possible everything that has happened. See you in the next edition!